Wow! Way too long since I've posted. I haven't done any markets since the Museum shut down our Second Saturday Artists' Market. But I'm still making beads and jewelry. I hope to get some new pieces listed in my Artfire Shop soon. Thanks for your interest. If you want to see what I'm up to currently check my DebiDeaux on Facebook page or my DebiDeaux Designs Page on Facebook. DebiDeaux at Youth Art Fest! It's Youth Art Month at the Alexandria Museum of Art. And there will be a big celebration this Saturday! Talent Show, Face Painting, Hands On Crafts for Kids of all ages, Chalk Fest, Henna Tattoos, Luminaries, Prayer Flags, Paper Hats, Tie Dye, Beading, Pottery, Weaving, Kid-friendly food (think popcorn, snowcones, hotdogs and nachos!) and so much more! And, I'm giving away BugaBoos to kids! What are BugaBoos, you say? They are small cute little beads made to look like a bug. Made especially for the kids attending Youth Art Fest. See the picture above. It's time for the Second Saturday Art Market! Please come out and visit and support your local museum and artists. It's time for the Second Saturday at the Museum! I've been following my muse this past month. At this market I will have lots of new fish beads and at least 1 new Swamp Tree of Life bead. I've also got some new pens for your gift giving self or just your self. Please come out to the market to see me and many other local artists. The Museum is honoring Veterans this month. Activities include holiday card making for our veterans and soldiers. And I heard a rumor that Taking It To The Streets is back and better than ever. And don't forget - if you can't make it to the museum this Saturday, DebiDeaux Designs finished pieces are featured in the Museum Shop. Beaders get ready! Beading House aka Marge will host a 2 day trunk show a the Best Western on MacArthur on October 23 and 24, 2014. That is this Thursday and Friday. Marge has kindly offered me a table at her show. I will set up for Thursday only. The pic above is a few of the new fish beads I made recently. I will also have some new Halloween beads. Let us know if you need to come late on Thursday and we will wait for you. Marge will have work tables set up for any of us that want to work on a project. I will be working on one of my fiber projects. Woohoo! It's here! It's time! The Big Reveal! But wait! What am I revealing? What is Bead Soup Blog Party? 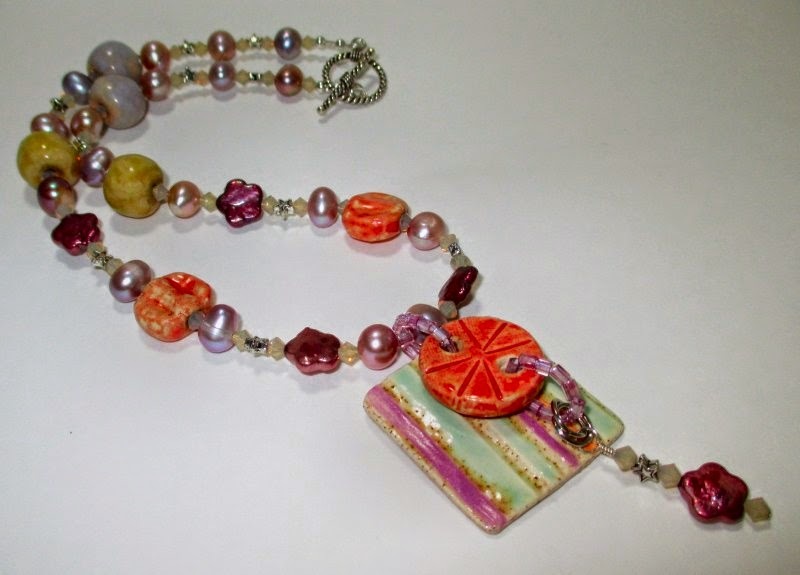 It is a bead exchange and challenge in a blog hop! Yeah, quite a mouthful. I'll try to explain - Organized by fabulous jewelry designer Lori Anderson. Lori started this years ago with a few beaders. It is now nearly 500 beaders and jewelry designers. Lori explains it best in her own Bead Soup Blog Party Blog. If you visit her blog after the reveal, you should be able to see the kit I sent her and what she did with it. I'm excited for the reveal! I was immediately in love with the ceramic beads. I was already crazy in love with the color combo of pale green and lovely light purple, popped with orange. Or rather, mint and orchid with tangerine. I kept trying to put that small piece of waxed cotton that Diana used to string the beads on, into the design. Tried to find some more of it but could only find leather and C-lon in that same shade. I could probably have ordered it online but I've waited too long for that. Tried to incorporate that aqua with a silk cord, suede lace, sari silk & bamboo cord. None of them struck the right chord, even weaving it thru Rollo chain and some over sized chain link. So, I decided to switch tracks and go with pearls. When I started looking for some pearls that matched the ones that came with my kit, I came across this pale mauve strand that I'd been hoarding for a while. And the sand opal Swarovski crystals, (yes, I've been hoarding those too) just cried out to join the party. Here is my creation - Ta Da!!! I am quite pleased with the way it came out. It's going to make great addition to my beach vacation wardrobe this year. But I still really want that piece of aqua in there. I'll sleep on it. It might come to me once the pressure of the Reveal is over. If I do change it, I'll post. Otherwise look for action shots from our vacation this summer. 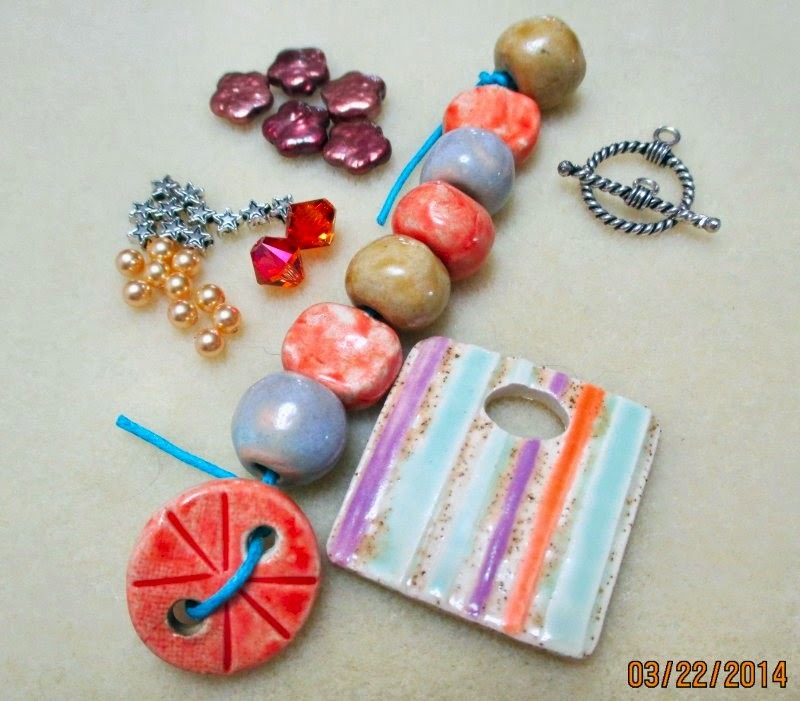 Thank you very much to Diana for the bead soup and Lori for the blog party! This was great fun!